This weekend is your last chance to see Chiller Thriller Theatre with Basil Q. Mylk-Bone! It stars the finest cast around and features some horrific tales with a comic edge! If you would like to see the show, tickets are just ten dollars! If you prefer eating a delicious catered meal a half hour before the show, it'll only cost you twenty dollars (Seniors $18.00)! Plus desserts at intermission! Friday and Saturday shows start at 7:00pm (Dinner at 6:30pm) and Sunday's matinee is at 1:00pm (Lunch at 12:30pm)! To make reservations please call 765-468-7631! Join us for our costume contest on Halloween! Dress up and YOU may win some special prizes! No tricks here, folks, just treats! Photograph by Cindy Lowe. It's been busy around these parts! Finally finished the script for Swann Song Christmas (Opening December 5), Chiller Thriller Theatre with Basil Q. Mylk-Bone debuted this past Friday and ran during the weekend, and we celebrated Halloween on Tom Cherry's Old Time Radio Show this past Saturday (In the picture up above, that's the delightful Angela Gick as the Bride of Frankenstein and a certain fat cartoonist as Jambi the Genie with Mr. Jerry Cole in the background)! The Halloween show was a great success with our first costume contest and a Farmland Center packed with an incredible audience. Busy, but fun times! Photograph by Kristin Wolfe. Hey, I Just Wrote This! "Well, I told you all that Elmer is working for a bakery and I got me a job, too. I work as a secretary for Wyatt, Chambers, Simpson and DuBois. I still haven’t figured out what they all do there. They’re either lawyers or accountants or doctors or maybe all three. Nobody has ever really told me. I’m in the secretarial pool. Now one of my favorite things in Nashville is riding the escalators at Harveys Department Store. I practically ride it every day at lunch. Up and down, up and down, up and down! It’s so relaxing. And I always enjoy the little flutter in my stomach when those moving stairs climb up to the second and third floors. It almost feels like I’m flying! It is certainly a sensation! This Saturday Tom Cherry's Old Time Radio Show celebrates Halloween as we present a classic episode of Suspense! Starring Wendy Carpenter, Sean Heline, Gabe Carpenter, Bob Green, Missy Donahue, Katy Wolfe, Angela Gick, our soundman and soundwoman, Jerry and Judy Cole, and our special guest stars, Jeff Shull, Dana Jones, and Shaun Berkey! Plus Hoppy confronts some mad scientists on The Happy Hoppy Hopper Show and Cousin Oliver threatens Those Funky Idiots! We'll also play It Pays to Be Creepy and our very own Bob Green and Missy Donahue sing! That's this Saturday (10/25/14) at the Farmland Center @ 3:00pm! Tickets are just a dollar! Popcorn and refreshments will be available! We'll also be having a Halloween costume contest so dress up in a costume and you may win a special cash prize! Can't make it? You can also listen in by clicking on the radio icon at http://www.farmlandindiana.org/ or on any mobile device through the TuneIn App, keyword Farmland Radio! Tune in, turn out, and we'll see you on the radio! GOOD NEWS: The wonderful Cindy Lowe recently finished work on one of the stars of my play, Two Guys and a Pearl! 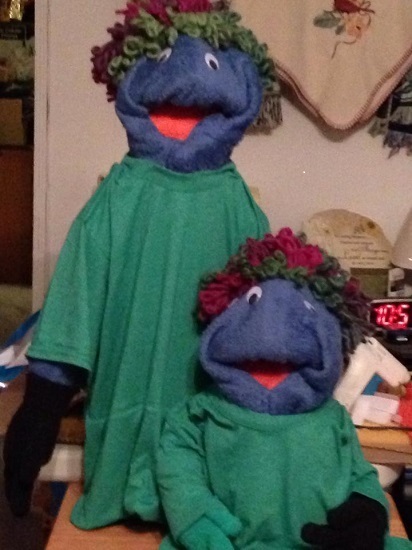 Meet Little Guy and his stunt double, Mort! Little Guy will be making his stage debut as part of Chiller Thriller Theatre with Basil Q. Mylk-Bone on October 24 at the Farmland Center! BAD NEWS: My laptop finally called it quits so my presence on the Interwebs may be a limited for a bit. Thankfully my Aunt Lee Ann is letting me use her computer to write scripts and surf the world wide web for awhile as I decide on my next computer purchase. Thanks, Aunt Lee Ann! GOOD NEWS: Ending on a happy note, the radio gang loaded up the radio Winnebago and took Tom Cherry's Old Time Radio Show on the road to Heather Hills Baptist Church in Indianapolis yesterday. We all had fun performing for the church's chili cook off and we met a lot of great people! Plus we had some tasty chili as well! Thanks to Missy Donahue, Katy Wolfe, Jeff Shull, Jeff Rapkin, and Jerry and Judy Cole for helping create another fantastic show! Coming Soon: Swann Song Christmas in December! In the meantime, write, write, write, and more write.